Rolling Thunder frame, Jim's S.E 120, 5 speed, jockey shift, hydraulic clutch, MT 15 x 15 on the rear end, heads up display mirrors, and much more for under $25K. Nice build. What kind of rear did you go with. I really like this! 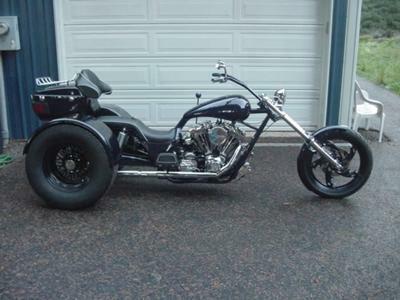 The rear half isn't overdone with loads of fiberglass and the front half is full-on chopper. This is far better than what you get with those kits used to transform a bike into a trike on a weekend. I'd like to see more of this. How 'bout adding a picture taken from the front and one taken from behind? COOL MAN!!! 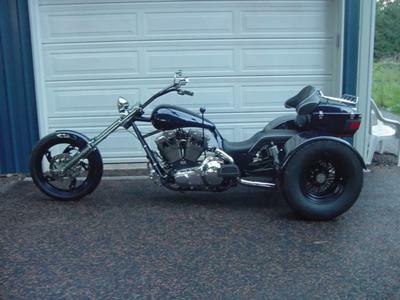 I'd like to build me a trike one of these days!